I m just at Page 27. But I already have learnt so much from the very detailed description of all the metrics and very importantly how to really apply it to my work. I just opened an excel and redo the case study on this book and felt totally absorbing the methodology and analytical skills! Thanks so much Tom and Bill! Bill Albert is Director of the Design and Usability Center at Bentley University. Prior to joining Bentley, Bill was Director of User Experience at Fidelity Investments, Senior User Interface Researcher at Lycos, and Post-Doctoral Research Scientist at Nissan Cambridge Basic Research. Bill is an Adjunct Professor in Human Factors in Information Design at Bentley University and a frequent instructor at the International Usability Professional’s Association Annual Conference. Bill has published and presented his research at more than thirty national and international conferences. 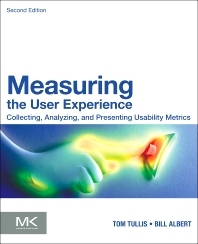 He is coauthor (with Tom Tullis) of Measuring the User Experience and Beyond the Usability Lab. He is on the editorial board for the Journal of Usability Studies. Tom Tullis is Vice President of Usability and User Insight at Fidelity Investments and Adjunct Professor at Bentley University in the Human Factors in Information Design program. He joined Fidelity in 1993 and was instrumental in the development of the company’s usability department, including a state-of-the-art Usability Lab. Prior to joining Fidelity, he held positions at Canon Information Systems, McDonnell Douglas, Unisys Corporation, and Bell Laboratories. He and Fidelity’s usability team have been featured in a number of publications, including Newsweek , Business 2.0 , Money , The Boston Globe , The Wall Street Journal , and The New York Times.